Last night, I returned from a work-related trip to the Motherland. While my family and I have spent a fair amount of time in Germany, especially growing up and to visit with my grandparents, this was my first trip to Berlin. So, after two and a half days of full-day meetings, I was ready to eat my touristy way through the city. Obviously, after I got home from the airport last night, I just had to re-create some of this for the Husband. In the morning, get the pork cooking. Refer back to our go-to recipe, and only go through step two (putting all the ingredients in the crock pot and setting it on low for 8-9 hours). About an hour and a half before dinner time, get your cabbage going. Immerse the cabbage (cored and sliced) in a bowl of cold water. Heat the butter in a large dutch oven over low heat. Add onions and cook until golden. Drain the cabbage slices and then add to the pot, along with the sliced apple, the red wine vinegar, honey, salt and (if you like) caraway seeds. Cover the pot and cook over medium-low heat for about 60-90 minutes, or until the cabbage is soft. Do not cook for too long – it will either turn to mush or turn bitter. About 15 minutes or so before serving, get water boiling for your spaetzle or egg noodles. 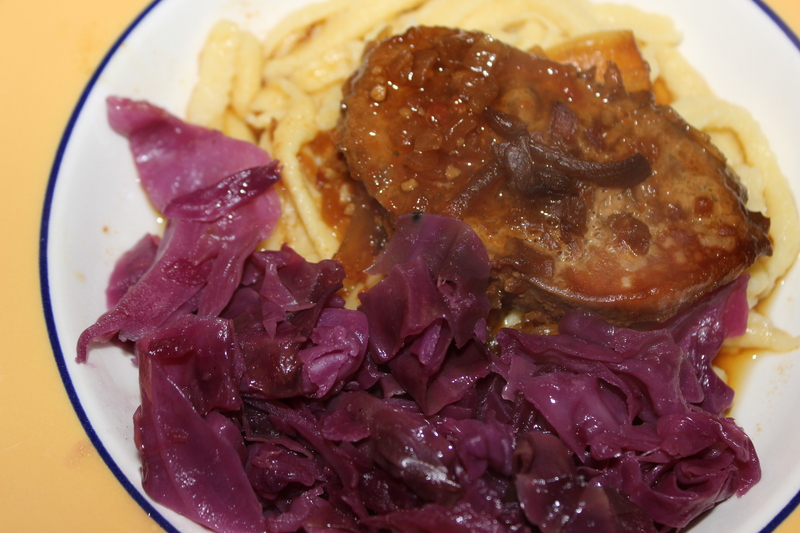 Serve the spaetzle topped with pork and a side of cabbage. Guten Appetit! Our pork (really, the Husband’s) is a go-to and there’s a reason why: it’s delicious. Having spaetzle (especially fresh, which I carried on the plane back with me!) was a special treat, and took me right into my mom’s and grandmother’s kitchen. This was true comfort cooking. I’ve never made cabbage before, and to be honest, this recipe was maybe a touch sweet. That being said, it provided the perfect tang and balance to the rest of our German meal! The big bonus here: plenty of leftovers, which will serve us well this (short) Thanksgiving week. Love to revisit Berlin with you, if only online. Yes, the food tends to be heavy and hearty. Luckily you did not try “eisbein” or pigleg,! Wish you had been there!